Is Osteopathic Treatment effective on Cervicogenic Dizziness? While answering the question, "Is Osteopathic Treatment effective on Cervicogenic Dizziness", I must preface to say I am not an osteopathic physician and do not practice in that theoretical construct. However, for those readers who understand the mechanisms of manual therapy and history behind the field of Physical Therapy and Osteopathic medicine; I am sure you can appreciate the correlation of Osteopathic medicine and subset of Manual Therapy within the larger scope of practice in Physical Therapy. Here is a synopsis if you haven't delved into the history. Understanding this correlation will allow the clinician to delve deeper into the literature of other professions in order to have a broader consideration of the effects of manual therapies on individuals suffering from Cervicogenic Dizziness and ultimately give your patients the most comprehensive treatment. While inquiring PubMed for literature support, unfortunately the terminology of Cervicogenic Dizziness comes up empty. Why? Well, read a previous post for that. Nonetheless, Cervical Vertigo brings me information from Hulse et al in 1975. As expected, the thought process realms from disturbances of the upper cervical spine and the authors recommend manipulation as treatment of choice. A case report by Fraix in 2009. A case series by Berkowitz in 2009. This study showed that OMT is generally well tolerated in patients with vertigo. It also demonstrated that it is feasible to recruit a population of patients with vertigo who can complete a course of OMT and collect data by using the DHI. A randomized control trial that examines the efficacy of OMT in patients with vertigo is warranted, given that OMT may be a reasonable treatment for vertigo and the functional impairment associated with it. As far as I know, a follow-up RCT designed to compare Osteopathic Treatment to Vestibular Rehabilitation never made it to publication. However, we do have some other evidence of the effects of osteopathic treatment in the last few years. 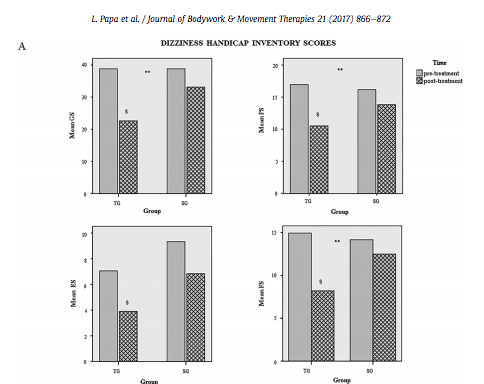 Osteopathic manipulative treatment for spinal somatic dysfunction improved balance in patients with dizziness lasting at least 3 months. In conclusion, the evidence is slowly, but starting to mount to give more credence to Osteopathic Treatment for Cervicogenic Dizziness. I do not hesitantly justify this as simply another means of evidence denoting the benefit of manual therapy, which can be provided by trained physical therapists, for the treatment of Cervicogenic Dizziness / Cervical Vertigo. The justification for our services and approaches are continuing to mount, for the sake of the patient, our referral sources, for us personally and for the 3rd party payers. Anyone who has taken my courses knows evidence is a top priority and you will get the information you need to not only learn how to diagnose and treat Cervicogenic Dizziness, but the paper trail that puts more substance into our practice. Newer PostConcussion: Purely a brain injury or are there more pragmatic treatments? Older PostWould you harm a patient with manual therapy already diagnosed with concussion?